Newfoundland and Labrador, the Far East of the Western World, is renowned for its friendly people, marine wildlife, long history and stunning seacoasts. The region offers a wide variety of touring experiences for today’s discriminating traveler, and appeals to those who seek to connect to the real and the unspoiled. The 17-kilometre wide Strait of Belle Isle separates the island of Newfoundland from Labrador. Bordering on the Canadian province of Quebec, Labrador remains a vast, pristine wilderness where the northern lights shine over the largest caribou herd in the world. It is the sea that defines the more populous Newfoundland. An underwater continental shelf that stretches out hundreds of miles from shore includes the Grand Banks, renowned for its fish stocks. Over these shallows wash the nutrient rich cold waters of the southward moving Labrador current, bringing with it Arctic sea ice and huge icebergs. From the south the Gulf Stream brings warm water from the Caribbean. The mixing of these currents creates an environment where marine life flourishes. This abundant sea life provides food for millions of seabirds to raise their young, and also entices whales to tarry awhile on their way to summer feeding grounds in the Arctic. Newfoundland and Labrador has more than 60 major seabird colonies. The most accessible is at Cape St. Mary’s on the Avalon Peninsula where thousands of Northern Gannets nest atop a sea stack at eye level just 50 feet from the cliff top. Gannets and other birds feed on tiny capelin, sand lance and other fish. Perhaps the most famous seabird sanctuary is at Witless Bay, 30 miles south of St. John’s. 2.5 million Atlantic puffins nest on three protected islands just offshore while the waters teem with humpback and minke whales. Whale watching season – late spring and early summer – is also the best time to view icebergs. It is a unique treat that is best enjoyed from one of the tour boats that cruise the reserve, or from a sea kayak. Canada’s easternmost province is also famous for its geology. A notable UNESCO World Heritage Site is Gros Morne National Park on Newfoundland’s west coast. The park’s Tableland Mountains are an example of the earth’s mantle at the surface, evidence geologists used to confirm that the continents move. The park is also famous for its fjords, especially Western Brook Pond, an inland fjord with a small opening to the sea that is almost totally surrounded by 2000-foot high cliffs. Newfoundland’s location has always played an important role in its history. Human habitation began here 9000 years ago when aboriginals arrived, following the retreating glaciers. The oldest funeral monument in North America is located at L’Anse Amour in southern Labrador. The first Europeans, the Vikings, arrived 1000 years ago. Today, L’Anse aux Meadows is a UNESCO World Heritage Site with reconstructions of Viking sod hut dwellings. Between the sixteenth and eighteenth centuries, hardy folk from the west of England and Ireland settled in Newfoundland’s sheltered bays along the rugged shores to catch fish. In the small villages and towns, their descendants still pursue a way of life that has changed little over the centuries. Words and expressions that were familiar in Shakespeare’s day still grace the tongues of coastal residents. It is in these outports that you will find charming local festivals. Dory races, farmers’ field days, and folk music festivals are wonderful places to meet the folks who live here. Newfoundlanders are universally recognized for their warmth and openness. Strike up a conversation with someone in a store, on a wharf or at the post office and you might just find yourself in someone’s home. Stories, songs and local lore are all delivered in a distinct accent that is a bit of English and Irish dialects mingled into a unique language. It is so distinct that there is even a Dictionary of Newfoundland English. In cosmopolitan St. John’s, you can walk out of a fine restaurant and down the oldest street in North America. This old port has changed from the rough-and-tumble days of pirates and adventurers, but it is still a lively seaport. Downtown St. John’s has much to offer. Music for every taste, art galleries, a theatre, the Newfoundland Museum, and a fine wine cellar are just a few of the attractions. From atop Signal Hill, where in summer cadets perform 19th century military maneuvers, the ancient city stretches out before you. Brightly colored houses ramble up a hill topped by a cathedral. Ships move in and out of the harbor. 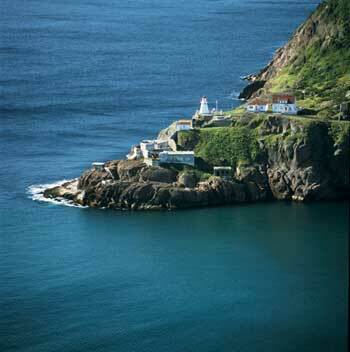 Off to the south is Cape Spear, the Far East of the Western World, and a must-see for any visitor. An hour’s drive south of St. John’s is Ferryland, where Lord Baltimore’s 17th century colony is being excavated. In Conception Bay, you can visit Brigus, the home of Captain Robert Bartlett, who accompanied Admiral Robert Peary on his polar explorations. His house is a National Historic Site. Nearby Cupids is the oldest English settlement in Canada. In Harbour Grace, the local museum is built right on the spot where pirate Peter Easton had his headquarters. Further along the north shore is Northern Bay Sands, one of the finest beaches in Canada. At Heart’s Content in Trinity Bay, you’ll find the cable station from which telegraph messages traversed the first Trans-Atlantic cable. Everywhere you go, you will find people eager to tell the history of their area. Newfoundlanders are proud of their past and have conserved many artifacts in local museums. In Hiscock House at Trinity, for instance, you can see how a local merchant family lived in the 19th century. Trinity is also the site of a summer theater festival. At Boyd’s Cove in Notre Dame Bay, a new center interprets the now-extinct Beothuk aboriginal tribe. And at Port au Choix on the island’s northwest coast, another new center contains artifacts of the ancient maritime Arachic and Dorset Eskimo cultures. Most people visit Newfoundland and Labrador during the summer, but it is fast becoming known as a great place for winter sports. Marble Mountain near Corner Brooke on Newfoundland’s west coast has some of the best ski slopes in eastern Canada, and new ski facilities are now open in Clarenville, Baie Verte and Gander. Whatever the season, visitors are guaranteed a warm welcome.